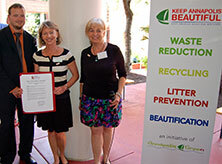 On June 23, 2015, just before Green Drinks Annapolis began at Baroak at the Loews Annapolis Hotel, we held a ceremony to announce our affiliation with Keep America Beautiful, marking a big move forward for our organization. Keep America Beautiful is the nation’s leading nonprofit that brings people together to build and sustain vibrant communities. With its powerful network of community-based affiliates, KAB works with millions of volunteers who take action in their communities to transform public spaces into beautiful places. That mission fits perfectly with Annapolis Green. Whether the place is a community garden, a city park or a vacant lot, public places provide a neutral space in which people can come together with a shared purpose of community building. By continually improving public spaces while caring for neglected ones, positive social and economic change occurs in communities across the country. We began working with KAB last summer. Our "Do Good. Have Fun." project — the clean-up and refresh of the Ellen O. Moyer Back Creek Park — was funded by a grant obtained via KAB. We see our mission as combining care for the environment with beautification because both are part of building a vibrant, sustainable community! Cigarette Litter Prevention Program — In the summer of 2015 we will launch a program to keep cigarette butts off our streets and out of our rivers with the Alliance for the Chesapeake Bay, funded by a KAB Grant. We're calling it "Scuttlebutt." Watch for more details. GameDay Recycling Challenge — A goal of ours for the fall of 2015 is to participate in the KAB GameDay Recycling Challenge program at the Navy Marine Corps Memorial Stadium during Navy Football games. The GameDay Recycling Challenge is a friendly competition for colleges and universities to promote waste reduction at their football games. During the challenge, colleges and universities implement waste reduction programs during home football games. Schools track and report waste reductions and disposal data that is used to rank the schools. The competition is run by a partnership of the College and University Recycling Coalition (CURC), RecycleMania, Keep America Beautiful (KAB) and EPA’s WasteWise program. KAB has so many turn-key programs, many with accompanying grants, that will benefit our community. And there is science to back it up too. Recently, KAB completed a literature review to better understand how researchers, experts and practitioners describe and understand the complex conditions that create blight and the many policy responses that communities are taking. Blight can include litter, graffiti, and abandoned properties. It’s the broken window theory: If you don’t repair a broken window, you can guarantee that more will be broken because it will appear that no one cares. Blight causes blight. Luckily, our community is pretty clean – we learned this in a litter survey we conducted as part of our affiliation requirements (see below). But there is plenty of room for improvement. Rural roads and many suburban roads are packed with beverage containers, fast-food containers and plastic bags… and cigarette butts. Wherever a fence or hedgerow acts as a barrier, you’ll see the litter. Remember the KAB crying Indian commercials of the 1960s? We’re going to work on a campaign as memorable as that to re-instill a “littering is just wrong” ethic in our community. While our historic downtown is beautiful – even more so with the hanging baskets and planters provided by Homestead Gardens – there are other parts of our community that are not. Keep Annapolis Beautiful plans to increase beautification in other parts of our community too. We would also like to acknowledge two organizations that we consider Keep Annapolis Beautiful Partners: The Brick Cos. for its financial sponsorship of our application to KAB; and Loews Annapolis Hotel for donating its meeting space and staff time to our initial organizational meeting last year and our workshop last week. Both companies’ operations are as Green as they can be and we consider them great supporters. Beautiful. Rose Flory and I went to NYC for conventions and I and Guy attended a ceremony in the Rose Garden with Lady Bird Johnson, who initiated the program. Annie Gay chaired the first city beautification committee. He was appointed by Mayor Pip Moyer. Alma Clapp was also a Chair. They are both deceased. It never hurts to acknowledge others engaged over time in a number of community activities." 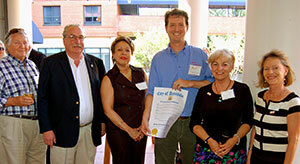 Keep Annapolis Beautiful is only the second KAB affiliate in the state. The other is Keep Prince George's County Beautiful, which is a government entity, part of that county's Waste Management Division in the Department of the Environment. Together we can make our community more beautiful and reduce the amount of litter on our streets - it ends up in the water and becomes an ugly public health hazard and threatens the health of our beloved rivers and Bay. Keep Annapolis Beautiful will lead the way. We have big plans moving forward. But first, some richly deserved thank yous. First, a big thank you to our KAB Trainer, John Deuel. He was the best meeting facilitator and trainer we could have ever had. Linda Barfield, who planned and helped us execute the litter survey. Linda worked with KAB in Puerto Rico and we were so fortunate that she gave of her time and expertise to help us get this big job done. We took an entire day to look at 50 areas, each ½-mile long, from Severna Park to Edgewater and assessed how littered they are. Bottom line: Overall it's not bad, but there are areas that are awful - and not where you might think! Watch for more about that later. The other volunteer we owe a big thank you to is Leslie Redwine. She designed and disseminated a community appearance survey to examine how our community sees itself and helped us assemble our 44-page affiliation report. It was a difficult job and we greatly appreciate her time, brainpower and persistence. 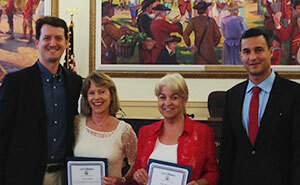 At our affiliation ceremony, four Annapolis City Alderpersons and a representative from the County Executive presented us with citations for our work over the past 10 years and for what we will do for the community with Keep Annapolis Beautiful. June 23, 2015, was declared Keep Annapolis Beautiful Day in Annapolis. In addition, the City presented Elvia and Lynne with citations at the last city council meeting on June 22, 2015.